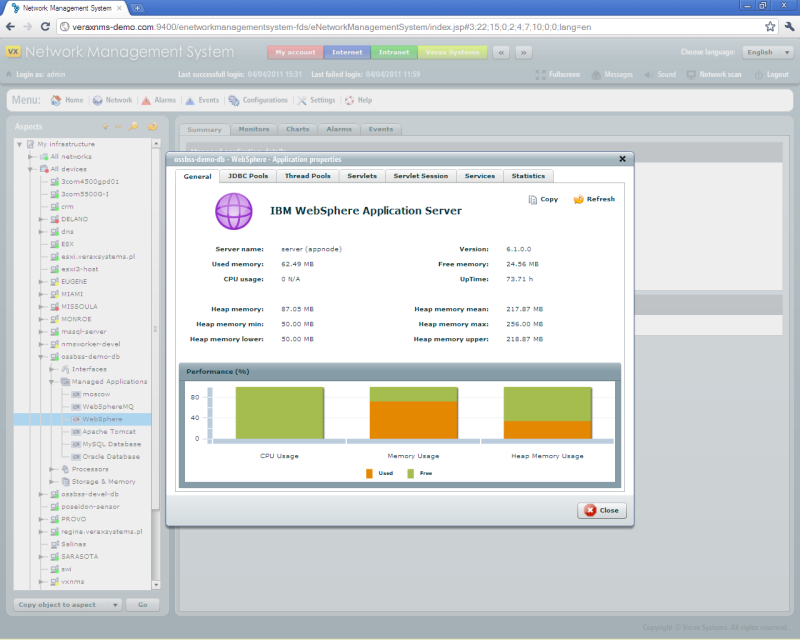 Verax NMS & APM IBM WebSphere management plugin enables easy monitoring, alerting, health check, management and performance reporting for IBM WebSphere application servers. Server details: name, software version, JVM environment version, used & available memory, uptime and current CPU usage. Heap memory statistics: current, maximum and average consumption. Summary statistics on CPU, memory and heap memory usage. The JDBC (Java Database Connectivity) pools view provides detailed information about configure JDBC connection pools and their statistics such as PercentUsed, PoolSize, FreePoolSize and others. The thread pools view provides detailed information about thread pools configured on a WebSphere server as well as individual pool statistics such as PoolSize, ActiveCount, CreateCount and others. The servlets view provides a list of servlets for all applications within the WebSphere server as well as their individual statistics such as Servicetime, RequestCount, ErrorCountand others. Detailed statistics on sessions to each servlet are also provided including information such as ActiveCount, LifeTime, TimeSinceLastActivity and others. This view provides all performance statistics maintained by a WebSphere server such DCS, Dynamic Caching, HAManager and others. The plugin provides predefined templates for most commonly monitored IBM WebSphere items (listed in the table below). Other, user-defined sensors and performance counters can be added.